Olivier Saguez has began his career in one of the world's first design agencies, set up by the pioneers of design, the CEI Raymond Loewy. In 1987 he meets Philippe Michel, an advertising executive at CLM / BBDO. Starting from a common idea: "Before communicating far, you must communicate close to home", they founded, Proximité, the first Paris subsidiary of the advertising group BBDO. Here he developed the idea of putting the brand concept into the product, combining it with a brand strategy. 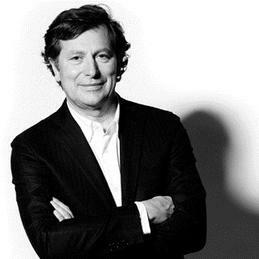 After 10 years at the head of Proximité and after the death of Philippe Michel, he left the BBDO group and the world of advertising to return to the design business. Based on one simple idea, "in a word ‘brand’, there is branding", he founded Saguez & Partners in 1998, a new, 100% global design and 100% independent agency, in which he brought together strategic thinking and creativity. Saguez & Partners is committed to increasing brand performance using three levers: brand culture, retail efficiency, implementation management and is now one of the leading global design agency in Europe. Saguez & Partners is specialized in eight great expertises - Design Strategy, Design Identity, Product Design, Service Design, Environment Design, Architecture Design, Retail Design, Workstyle Design - to create a clear consistency between the image value and use value of its projects. 150 employees work together for various clients such as Unibail-Rodamco or Aéroports de Paris on large architectural projects; SNCF or Galeries Lafayette on branding issues; Kusmi Tea, Fauchon, Paul on retail concepts.